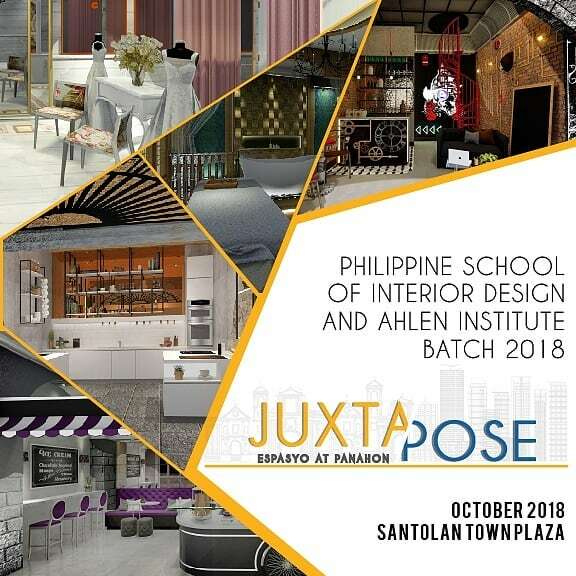 Old, historic structures and new design ideas come to life in JUXTAPOSE: Espasyo at Panahon, the Philippine School of Interior Design (PSID) Advance Class of 2018 exhibit happening from Oct. 1 – 31, 2018 at the Santolan Town Plaza in San Juan City. he Pang-industriya gallery highlights design solutions for old industrial sites as can be seen in the booths “13 Fit Street”, “Dor-Moderno”, “Station No. 15”, “Polo Estacion”, and “KM 102 Gentleman’s Barber Lounge”. Tucked away in a quiet area of San Juan is the Castro House. Built in 1933 by Sps. Melquiades & Victoria Castro, the house hides a 15 sqm bomb shelter underneath its kitchen floor. This unique feature inspired the group to transform it into a speakeasy. Multi-localism, referring to an awareness of foreign cultures and imbibing them locally, is used as a concept for our design—which was achieved by combining the intimate allure of a speakeasy, the spartan look of a bomb shelter, and the familiar elements of Filipino style. A well-known tourist spot in Vigan, Calle Crisologo is home to heritage houses, some of which have been converted into inns, museums, restaurants, and souvenir shops. Inspired by the architectural elements of the Cabildo Ancestral House in Calle Crisologo and the rich culture surrounding it, the group came up with an interior that seeks to embody its distinctive Spanish colonial character. Because of its location, the group decided to repurpose the space into an atelier, showcasing the works of an outstanding Filipino couturier. Built in 1929, the Tañada ancestral house was purchased by the late Sen. Lorenzo M. Tañada and his wife in the early 1950s, where they raised their family of 9. The grounds were later on split among their children, until such time that only the main house remained on a much smaller plot of land. A stroke of wild imagination and a little creativity is all it takes to reimagine the Tañada ancestral house into a modern residential space. Trends in residential living have seen major changes throughout the years. Developers are building vertically and compact living has become the norm in order to maximize square footage. Built in 1927, the Laurel Ancestral House is one of the first houses built along F. Benitez St. in San Juan. Four generations of Laurels have lived within its walls and ownership still remains in the family. In 2010, major renovation efforts were undertaken to ensure the structural integrity of the house remained intact. Given its location within a residential neighborhood in San Juan, the group has chosen to adaptively reuse Laurel’s Ancestral House as a Private Spa. The booth consists of three areas—the massage area, lounge area and tub area. As an ode to the house’s original architectural details, the group has decided to use Modern Filipino as the spa’s design theme. Situated in a quiet neighborhood in the city of San Juan is the Castro House. Built in 1933 by Sps. Melquiades and Victoria Castro, the Castro House has been a family home since its construction. Because foot traffic is relatively low in the area, the group has rethought the space as an events hall. Along the side of the house is a spacious patio where an intimate gathering, such as a private wedding, can take place. Inside, there is a roomy and spacious living area on one side and a dining room on the other side. The second floor holds four bedrooms, one of which the group has decided to highlight as a holding room for a bride preparing for her big day. The Punzalan Ancestral House was one of the homes of Atanasia Aniversario, popularly known during her time as Kabesang Tana, who was the owner of one of the largest fortunes in Taal. Since being built in the 1900s, the house has seen generations of the family come and go. Owing to its strategic location, the house has since been converted to a tourist inn. Taking the idea one step further, the group proposes to add a spa and teahouse to the existing inn in order to maximize the business potential of the site. The spa will center on the Filipino ancient art of healing or ‘hilot’ with the use of volcanic rock massage, while the teahouse will highlight special herbal teas grown right in the backyard of the house. Intramuros today is a hubbub of activity—from students plying their routes to nearby schools, to vendors selling their wares, and to tourists exploring the cobblestoned streets. Within this microcosm of Manila life, we envision the Aduana Building revived as a bustling commercial building with a bookshop and café, attracting tourists and locals alike. La Moneda Bookshop and Café takes inspiration from the history of the Aduana as the Mint House or Casa de Moneda, where the first Philippine coins were made. To echo this pivotal moment, the overall design of the space reflects the lustrous shine of the coin—from the artwork showcased against the coin wall to the copper and metallic touches in the fixtures and fabrics used. The former PSID Building located at 2230 Pasong Tamo Street in Makati City is one of the iconic buildings designed by Architect and Interior Designer Lor Calma. Built during the 1960s, the building boasts of a contemporary modern design not common during that era. The space that the group chose to adaptively reuse in this heritage building is the hallway and entrance to the school. There are three (3) distinct elements that can be found—the wooden wall inscribed with baybayin, the adobe stone wall, and the steel gate made of wrought iron grills in all its details. Focusing on the above-mentioned elements, the group has chosen to reimagine the space as a cafe where creatives can meet and discuss ideas, or simply to chill and absorb the vibe of the place. The Philippine School of Interior Design can trace back its beginnings to 1967, when it first launched its four-term basic course. Designed by Architect Lor Calma, the Philippine School of Interior Design, then called the Philippine Center of Interior Design, was housed in a levitating building built in the modern international style. Located along the stretch of Pasong Tamo in Makati, the building stands out among its peers with its distinctive features. No detail was also spared inside with one wall featuring an adobe stone finish, while another wooden wall is inscribed with baybayin. Furthermore, details such as the paint-splattered floor and the minimalist brass staircase, coupled with the vast windows looking outwards creates a bold statement that is ephemeral yet timeless. Truly, the architecture and architectural interiors showcase the best of 1950s modernism movement. Designed in a neoclassical and beaux-arts style, the Regina Building is one of the few buildings in Escolta that has survived the horrors of World War II. The building boasts of timeless design elements such as pedimented windows, balusters, bas-reliefs, and sculptural groups. Due to its location in the heart of Binondo, the group reimagined the space as a coffee bar that caters to men and women who are always on-the-go yet who would need their caffeine boost for the day. “Kusina Aduana” provides an experience to last a lifetime. It offers hands-on cooking classes in order for one to develop a deep appreciation of the flavors, history and culture of Filipino cuisine. Each participant will be able to prepare various dishes under the guidance of experienced local chefs at one’s own workstation. Discover and try the local food scene by experiencing some of the country’s famous delicacies. Explore and experience a local market where your chef will teach and encourage you to taste along the way. Get an in-depth glimpse into Filipino cuisine through a cookery course, which may vary based on the season. The Aduana building, which was once the headquarters for the Customs Office in Intramuros, has been reimagined and redesigned into a commercial complex. Within its premises is Below Zero Gelateria, where students and tourists alike can lounge around and beat the heat with the shop’s tasty selection. The proposed Modern Classic design brings together a timeless yet subtle air of sophistication reminiscent of Imperial Manila with a hint of humility and simplicity. Polished concrete was used for both the walls and the flooring while and bricks were used to mimic the remains of the building. Neutral colors run throughout the design including a touch of violet, a color often associated with the color of royalty. Antique mirrors decorate the ceiling and for a part of the wall to give the shop a vintage look while tufted furniture pieces with metal elements provide it class and elegance. The shop’s products are then accentuated through pendant lights positioned above the counter. Tanduay Fire Station is the oldest operating fire station in Manila’s University Belt area. The group’s vision to turn the station into an edgy modern gym hinges on the concept of making going to the gym feel like a night out. With this theme in mind, the station was outfitted with strip lighting, black walls and acrylic signages. Reaffirming the nightclub theme, a “dark and moody” atmosphere was created and accentuated by the lights. A hooped ladder, commonly used for industrial buildings, is used as a rack to hold weights and other gym accessories. Recycled black rubber salvaged from the old fire station serves as the cycling studio’s flooring, while the rest of the area is outfitted with resilient wood planks to withstand heavy foot traffic. Furthermore, the fireman’s pole was also retained and used as an accessory for the pole dancing studio. Wood from the ceiling dating back to 1897 was also salvaged and remade into a bench. Located at the corner of Madrid and San Fernando Streets in San Nicolas, Binondo, Manila, the San Nicolas Fire Station was established in 1901 as one of the first fire stations ever built in the country. Due in part to its location, the group envisioned the San Nicolas Fire Station as a modern and contemporary dormitory with the interiors and facade inspired by the station’s original design. The aesthetic blueprint of this mid-century modern dormitory was inspired by the accent walls and metal works derived from its old form. After being repainted and replaced with a more contemporary interior design, certain elements in the original San Nicolas Fire Station such as the fireman’s pole were left intact. The Tanduay Fire Station in Paco, Manila was first established by Hugh Bonner, a former chief of the New York Fire Department. After the Japanese occupation, it houses a central fire station and firemen’s training school. Currently, it is now surrounded by universities and commercial buildings. After visiting and experiencing the current situation of the building, the designers proposed to repurpose the storage room as a co-working bar. Situated along a highway, the PNR Polo Station served as the base for military operations of the first Republic. Today, the group envisions it to be an Artisan market and local wine shop–creating an avenue to showcase the nation’s local produce. Brick walls, arched windows, and wall treatments were retained and balanced with contemporary elements of the bronze mirror, steel, and illuminated acrylic. The capiz and a careful selection of furniture and accessories help create the Rustic Contemporary meets Industrial design. Built in 1892, the San Fernando Train Station is part of the Ferrocarril de Manila-Dagupan, the first railway system in the Philippines. Today, the San Fernando Train Station is reimagined into a Gentleman’s Barber Lounge. The Gentleman’s Barber Lounge is a members-only establishment that offers today’s discerning gentleman a place where they can retreat to refresh their minds and bodies, replenish their energy, and network with their friends. There is a barber shop with traditional grooming services, a lounge with comfortable seating, and a music area that features a curated collection of vinyl records. Though inspired by the original interior architecture of the railway station, the Lounge embraces a contemporary aesthetic. The concept of mixing old and the new is translated not just by the experience offered in the Lounge but also in its design.